I was fortunate enough to be a beta tester for the Emic2. I subsequently recieved a second production version of the module. Joe Grand of Grand Idea Studio did a great job designing this very elegant device. At 30mm x 32mm x 10mm and only 6 pins it can snuggle into a tiny space. 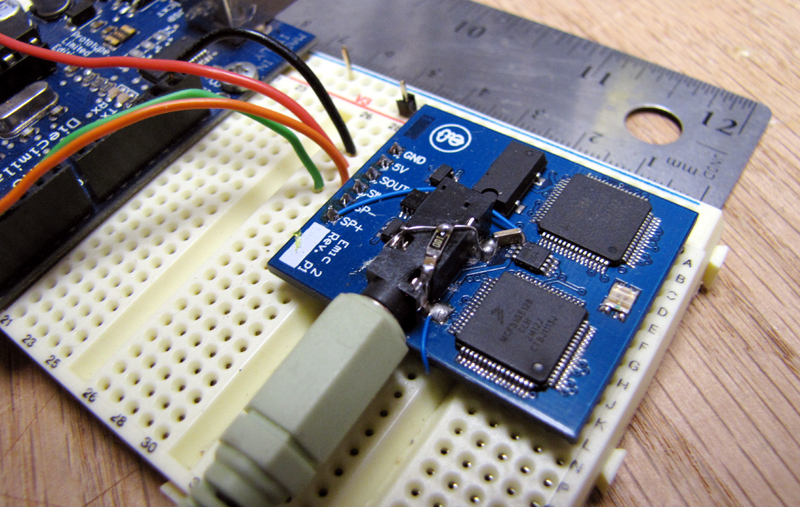 When it’s connected to a micro controller chip it can give voice to virtually any device… after a bit of hardware hacking. 😉 Joe has a video up of a hack he did on his kid’s toy. This little gem can be purchased from Parallax Electronics. It comes with a great data sheet that gets into the nuts and bolts of what this module can do. My girlfriend Lisa came up with a creative way to use two of these modules. She had the vision, I’ll be engineering the project. In this first of three installments, I’ll introduce you to the Emic2 and reveal the “idea” we have. This is going to be FUN!